Are you wondering what the average cost of catering for a wedding is? Your wedding breakfast can be slightly complicated when you approach it for the first time (even the name itself is a warning for this: it doesn’t have to include any breakfast!) but worry not. Bridebook is here to make your wedding planning journey as smooth as possible. Whether it’s with our Wedding Planning App (which is the #1 in the UK), our free planning tools or our handy articles that break down all the bridal jargon for you. Let’s get started by debunking the mysteries and breaking down all of your wedding catering costs! A starter, a main course and dessert for 100 guests at a manor house hotel, along with complimentary accommodation for the bride and groom and discounted rooms for guests. The first thing you need to know is that catering can be done in-house or you can hire caterers to come to your venue separately. 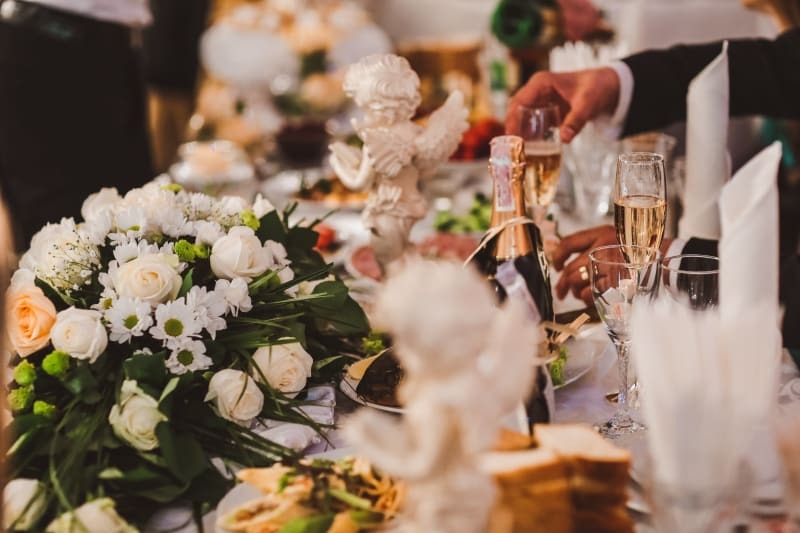 Venues that include catering are usually priced per head, meaning there will be a set price for every guest, which will include food (a buffet or sit-down meal), the venue rental and sometimes ½ bottle of wine per person for the meal and some bubbly for the toasts. If a venue is priced at a lump sum, it usually means that catering is not included and what you are paying goes towards securing the venue. What affects the price of catering? You will want each of your guests to have an awesome time, delicious food and drink, which means that the more guests you have, the higher the overall price of catering, as you pay for each plate consumed. Don’t forget to account for your guest’s plus ones, make sure you have them in your guest list so you have a total number of guests and your wedding budget will be in shape! 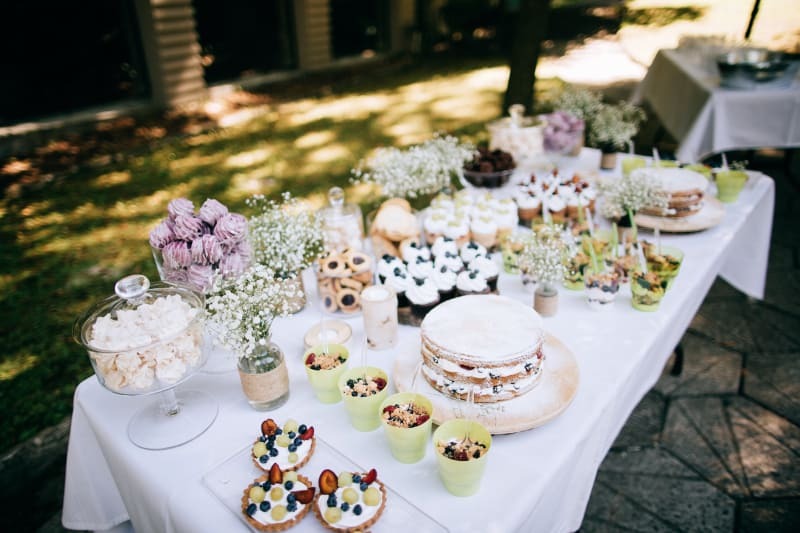 There are two ways of serving your wedding breakfast, a buffet or a sit-down meal, both of which have pros and cons when it comes to your budget. For example, for a sit-down meal, you would have to factor in the wages of the waiters (its recommended to have 1 per 11 guests). Alternatively, you can serve your guests a yummy buffet, which won’t need servers, but might require more food! So really it’s a question of preference and what your venue allows. If you really want the official feel of a sit-down meal but are limited by your budget, why not have guests carve up and serve their own food with a hog roast? Here are the UK wedding caterers that offer this serving style! Another factor that can affect the price of your wedding breakfast is your venue. If you are hiring outside caterers to come to a country house, which has a huge kitchen and all the facilities available, that can sometimes be cheaper than hiring a marquee which will need portable kitchen equipment. For example, renting a convection oven would cost £80, a microwave would be £30 and a water boiler would be £10, which can quickly add up, especially if there are lots of people to feed. Here are some tips on how to save money on your wedding venue! Lots of little bits further influence the price. Wedding venues offering in-house catering and exclusive use of the premises will be guaranteed to have a higher price than a hotel that will have other customers staying. If you are hiring outside caterers and they need to travel to your venue, they might charge you for their transport! Price per head– £139 or £149 for dinner, drinks and champagne for the toasts for 100 guests. Price per head– £225 for champagne upon arrival, canapés, four-course dinner, drinks and champagne for the toast. Price per head– from £38 for a three-course meal. Buffet price per head-£139 or £149 for dinner, drinks and champagne for the toasts for 100 guests. Buffet price per head– £119 for a starter, main and dessert. No drinks included. Price per head– from £28 for a selection of dishes. The kind of food that you serve at your wedding can also affect the price. For example, locally sourced produce and seasonal food will cost less than food that would have to be flown in (for example, those oysters that you love can add an extra £5 per person). Similarly, the more menu choices you have available, the higher the price that you would be required to pay. This is why most RSVP cards give guests a choice between a meat, fish and a vegetarian option! Alcohol is probably the biggest factor that will affect the price of your wedding breakfast. When choosing your alcohol you need to keep two things in mind: corkage fees and the types of alcohol that you want to serve. Corkage fees are either £5-11 per each bottle served, or the price of one of the house wines that your venue serves, but ask your venue what their policy is just in case! The kind of alcohol you serve also affects the price. Although a bottle of spirits will cost more than a bottle of wine, it will also serve more drinks, so cater to your audience when deciding what to get! You can save a lot of money by looking into the alcohol you’re serving at your wedding. Need a hand (or two) with wedding planning? Join Bridebook.co.uk and get all the tools you need to plan your wedding from start to finish. Plan your budget, find your wedding venues and suppliers, organise your guest list and more!